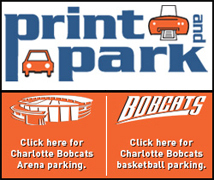 CHARLOTTE, NC (CelebrityAccess MediaWire) — As the Charlotte Bobcats Arena opened its doors this past weekend with an October 21st Rolling Stones concert, residents feared that the already tight parking situation in uptown Charlotte may get even tighter with the new venue in town – but they solution may be just a mouse click away. The arena has launched its Print and Park program on their website, which allows people to reserve parking spaces for special events at the arena, as well as real-time traffic reports, and suggested alternate routes around congestion. Officials say there are more than 20,000 parking spots within a 15-minute walk from the arena, and the price tag for each space will vary depending on the event. “People will not only be able to select the garage or parking lot that they wish, but they can also choose the price point that makes sense for them,” arena COO Barry Silberman told News 14 Carolina. Parking reservations can be made on the site up to 48 hours before an event, with only the price of the sport plus a $2.50 convenience fee.